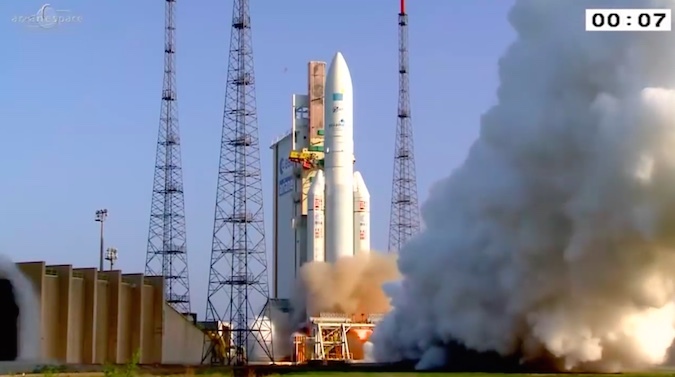 A European Ariane 5 rocket will propel two communications satellites from a standstill to a speed of nearly 21,000 mph (9,365 meters per second) in 25 minutes during a launch Friday from French Guiana. 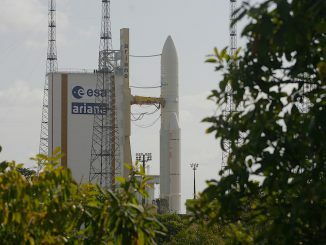 The nearly 180-foot-tall (55-meter) launcher will blast off from Kourou, French Guiana, at 2030 GMT (4:30 p.m. EDT; 5:30 p.m. French Guiana time) on its third flight of the year with the EchoStar 18 and BRIsat communications satellites. Both made by Space Systems/Loral in Palo Alto, California, the spacecraft will ride aboard the Ariane 5 in a dual-payload stack. 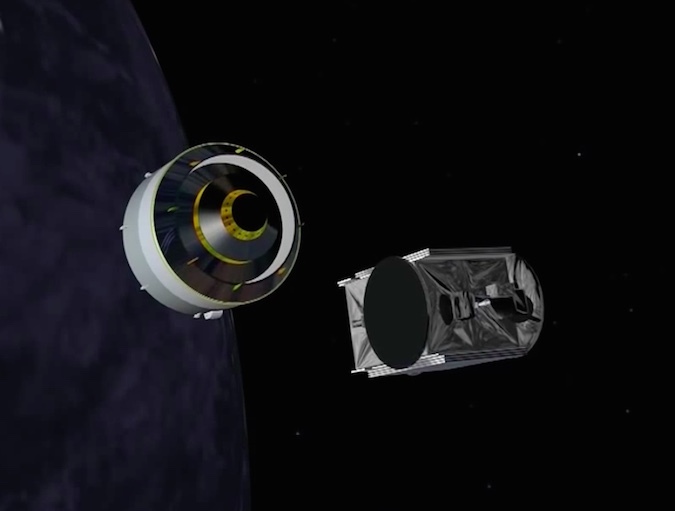 The larger of the two satellites, EchoStar 18, will deploy first, followed by separation of BRIsat around 42 minutes after liftoff. 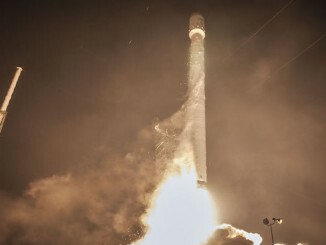 The rocket will target an orbit ranging from 155 miles (250 kilometers) to 22,224 miles (35,766 kilometers), with a tilt of 6 degrees to the equator. 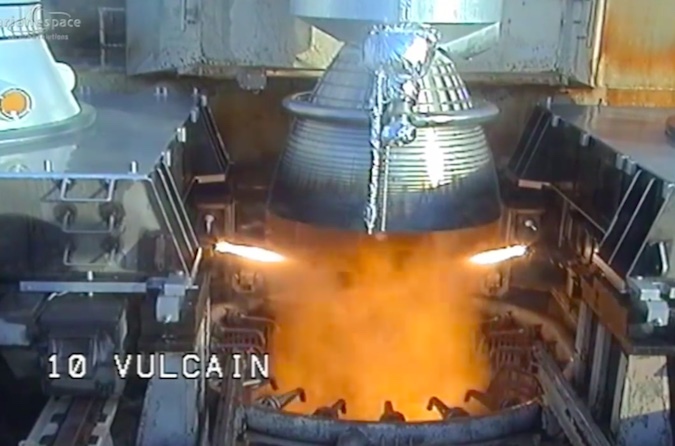 The Ariane 5’s first stage Vulcain 2 main engine ignites as the countdown clock hits zero, throttling up to about 300,000 pounds of thrust and undergoing a computer health check before liftoff. 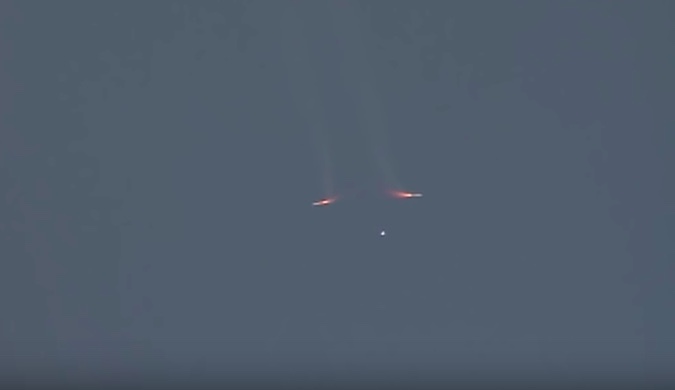 The Ariane 5’s two solid rocket boosters ignite seven seconds later, each generating more than 1.3 million pounds of thrust, to push the vehicle into the sky from the ELA-3 launch pad. 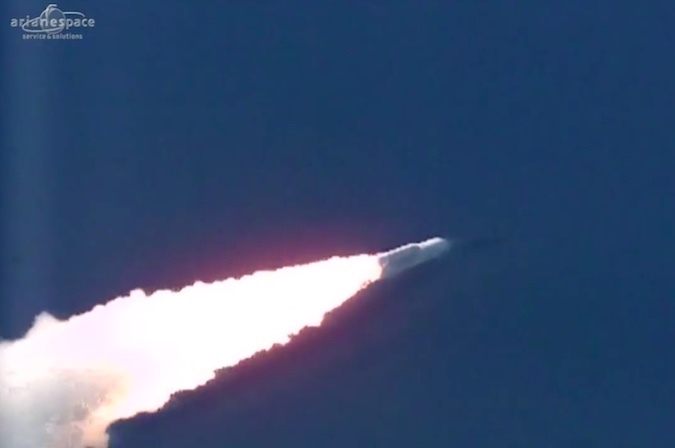 The Ariane 5 rocket surpasses the speed of sound, heading east over the Atlantic Ocean. After each consuming 240 metric tons, or about 530,000 pounds, of pre-packed propellant, the solid rocket boosters are jettisoned. 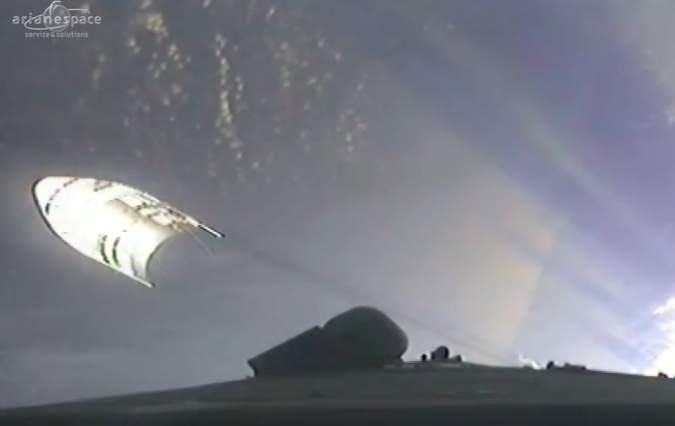 The Ariane 5’s 17.7-foot-diameter (5.4-meter) payload fairing, made in Switzerland by Ruag Space, releases in a clamshell-like fashion once the rocket flies above the denser, lower layers of Earth’s atmosphere. The Ariane 5’s core stage Vulcain 2 main engine shuts down after consuming 175 metric tons (385,000 pounds) of cryogenic liquid hydrogen and liquid oxygen propellants. 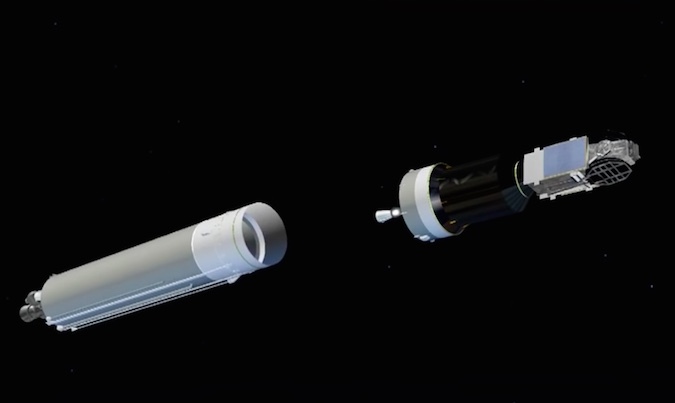 The Ariane 5’s first and second stages separate. 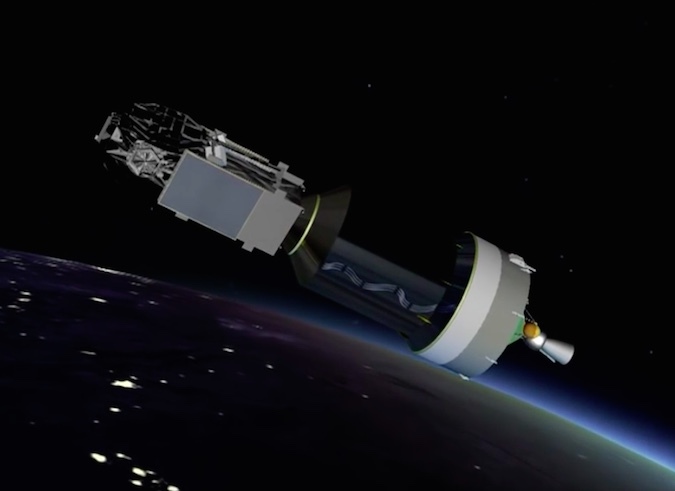 The 98-foot-long (30-meter) first stage will fall into the Atlantic Ocean near the Gulf of Guinea off the west coast of Africa. 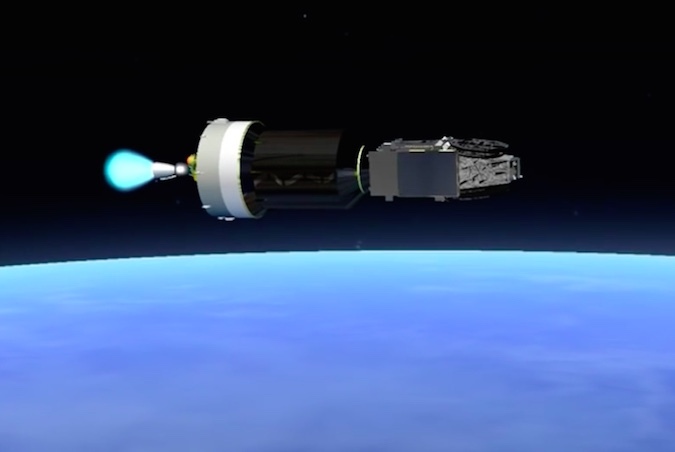 The Ariane 5’s upper stage HM7B engine ignites for a 16-minute, 27-second burn to place the EchoStar 18 and BRIsat satellites into geostationary transfer orbit. The HM7B engine burns liquid hydrogen and liquid oxygen, and generates more than 14,000 pounds of thrust. 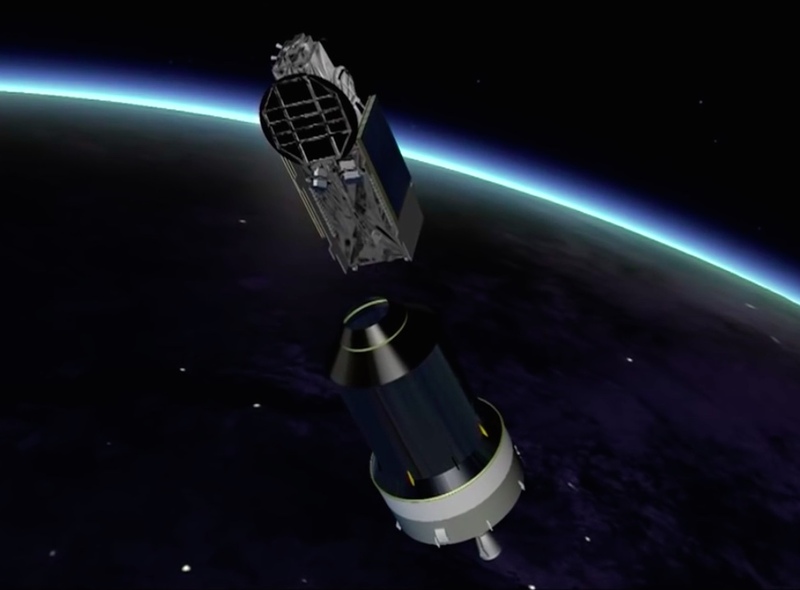 The HM7B engine shuts down after placing the EchoStar 18 and BRIsat satellites into geostationary transfer orbit with a low point of 155 miles (250 kilometers), a high point of 22,224 miles (35,766 kilometers), and an inclination of 6 degrees to the equator. 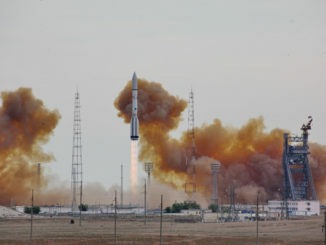 The EchoStar 18 satellite, riding in the upper position on the Ariane 5’s dual-payload stack, deploys to begin a 15-year television broadcast mission for DISH Network. 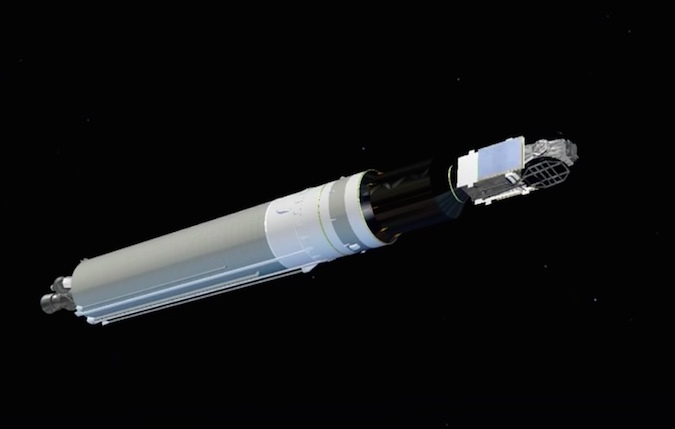 The Sylda 5 dual-payload adapter structure jettisons from the Ariane 5 upper stage, revealing the BRIsat spacecraft for deployment. 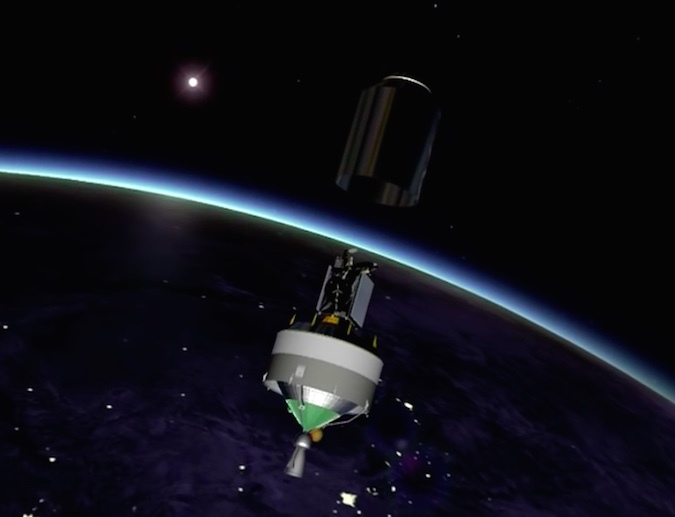 The BRIsat satellite is released from the Ariane 5 upper stage. Owned by Bank Rakyat Indonesia, BRIsat is the first communications satellite dedicated to support banking services.